Crave - Super Mario Bros. Super Show! After being sucked into a drain pipe, Mario and Luigi defend the Mushroom Kingdom from King Koopa. Neatness Counts/The Bird! The Bird! 1. Neatness Counts/The Bird! The Bird! Mario and Luigi demonstrate how to unclog a sink; a Birdo mistakes Toad for her missing baby. Mario and Luigi take in an orphan; Mario becomes the King of Cramalot. Mario shrinks in a steam machine; Koopa escapes to the Wild West with the princess. Marianne and Luigeena come to visit; Princess ends up as the wench of an evil sultan. Dr. Frankenstein asks Mario and Luigi to help him with his experiment; Mario and Luigi help a certain Mark Twang win a riverboat race. Mario gets amnesia; Koopa hosts a fake dinner. A vampire visits; Magic beans lead the gang to a castle in the sky. Elvis visits; Queen Rotunda falls in love with Mario. Mario and Luigi's mother visits; Mario and Luigi try to win a BMX race. An alligator is stuck in Mario's basement; Mario's group must free the natives of the planet Quirk. Luigi gets a free dance lesson; Mario, Luigi and Toad are hit with itching powder. Mario and Luigi take care of a dog; Mario and Luigi meet another lost plumber from Brooklyn. Mario's date turns out to be an alien; Koopa steals all of the spaghetti sauce in Car Land. David Horowitz interviews the brothers; Mario and Luigi help a hero get back into shape. A magician visits Luigi; Koopa and his minions are in a castle in Turtlevania. Magic Johnson asks Luigi to repair one of his trophies; Mario, Luigi and Toad must pose as pirates to rescue the princess. A woman loses her dog; Princess Toadstool turns into a baby. 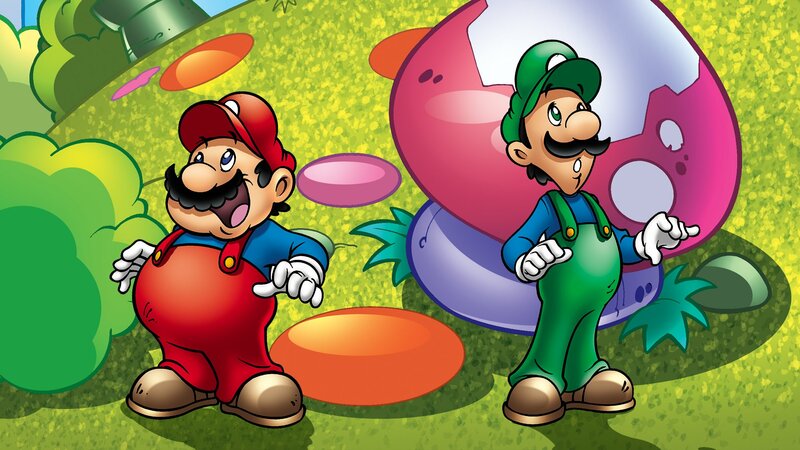 Mario and Luigi are nominated for Plumbers of the Year; Mario becomes a detective. Mario Hillbillies/Do You, Princess Toadstool, Take This Koopa...? 19. Mario Hillbillies/Do You, Princess Toadstool, Take This Koopa...? Mario and Luigi's hillbilly cousins visit; Princess Toadstool agrees to marry Koopa. Mario's mother's plant grows into a monster; Koopa uses a flute to lure children. When her band is unavailable, Susanna Ross asks the Mario Bros. to be backup singers; Koopa terrorizes a mountain town with a robot monster. A new pizza making machine begins to take over Mario Brothers Plumbing; Mario and Luigi become spies. A con man pretends to be Mario and Luigi's brother; Romano and Joliet are unable to get married. Luigi buys a watch that runs backwards; A fake volcano is used to trick a tribe of islanders. Luigi grows plants out of his body; Hooded Robin tries to reclaim all the gold Koopa has stolen. A bat infests Mario Brother Plumbing; A giant sea monster terrorizes Happy Harbo and King Koopa offers to help. Rob Stone asks to stay with the Mario Bros. to hide from a mob of fans; A leprechaun's pot of gold has been stolen by King Koopa. Mario and Luigi consult a fortune teller; Koopa grows enormous after eating sushi. The brothers recall a time in their youth when Mario ran away from home; King Koopa kidnaps Santa Claus. A gorilla escapes from the circus and winds up invading Mario Brothers Plumbing; Koopa and Lakitu try to take over Pastaland. An angry ghost of George Washington visits the brothers; King Koopa and his henchmen wear special hats that render them invulnerable. Mario and Luigi are drafted by the military; Koopa takes over Rapland. Inspector Kleen from the board of sanitation comes to inspect Mario Brothers Plumbing; A Zorro-esque hero saves Mario's group from Koopa. Vincent Van Gook arrives to give Luigi art lessons; King Koopa turns everyone into bricks. Zenned Out Mario/The Koopas Are Coming! The Koopas Are Coming! 35. Zenned Out Mario/The Koopas Are Coming! The Koopas Are Coming! The brothers turn to help from Obi-Wan Cannoli; Mario and Luigi team with heroic General Washingtoad in a fight against King Koopa's forces. The Marios strike oil and try to sell it to Ted Bull; Mario, Luigi and Toad try to rescue the princess with a Koopa-shaped Trojan horse. Mario and Luigi find a lost painting; Mario is bitten by a venomous snake. A bonk on Luigi's head leads him to start acting like a game show host; Koopa finds out about a cave full of gold coins. When the Marios win a contest, they must appear on the radio the next day; The group tries to find the missing Elvin Parsley. A visitor comes to Mario Brothers Plumbing after hearing they make the best pizza; Mario tells the story of how he & Luigi became plumbers. The brothers call in help to come up with an advertising jingle; Mario, Luigi and Toad ask a karate master for help rescuing the princess. Mario sets out to perform a series of tasks to win the "Chipmunk of the Month" award; Mario is convinced that he in an ape. An argument between the brothers escalates; Mario and Luigi are shrunk by a wizard's potion. The Queen appears at Mario Brothers Plumbing, wanting to fit in with the commoners; Peach delivers a basket of food to Grandma Toadstool. Mario and Luigi must babysit a fish; Mario becomes the "Provolone Ranger" to rescue his friends. Luigi attempts to learn French; Posing as a judge, Koopa sentences Mario and Co to the prison of Koopatraz. A baseball manager hires the Marios to sell peanuts at the ballpark; Mario's group tries to save Aqualand from Koopa's reign. The Marios become fed-up with the singing of a would-be opera singer; King Koopa is taking over Brooklyn. A letter from an old friend convinces Mario that she intends to marry him; Indiana Joe tries to recover a statue. The brothers prepare for a visit by Rowdy Roddy Piper; Mario and Luigi must retrieve a statue that repels crocodiles. Santa Claus appears at the Mario's home after his sled is stolen; King Koopa tries to destroy a Mushroom space colony. Cyndi Lauper waits to go on a picnic with Captain Lou; Koopa uses a robo suit to kidnap Princess Toadstool.